In social anthropology, as in other branches of science, there is a close relationship between research methods and theoretical problems. Advancing theory and shifts in orientation go hand in hand with the development of techniques and mutually influence one another. If the development of modern social anthropology owes much to its established tradition of fieldwork, it is also clear that the procedures that anthropological fieldwork should follow in the laboratory can never be prescribed in absolute terms nor become wholly standardized. Yet as anthropological analysis is refined, it becomes increasingly important that students in the field be aware of the need to collect basic kinds of data, and know how to set about doing so. 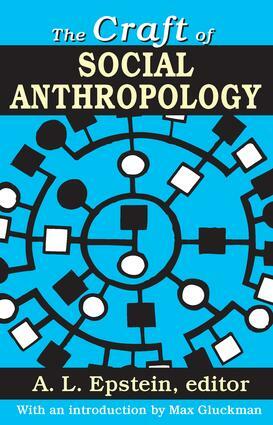 In this volume, anthropologists who have worked closely together for many years at the Rhodes- Livingstone Institute for Social Research, Lusaka, and/or in the Department of Social Anthropology, University of Manchester, discuss within a common framework modern fieldwork methods as tools for examining a number of problems of current anthropological interest. Elizabeth Colson, J. Clyde Mitchell, and J. A. Barnes stress aspects of the role of quantification in social anthropology and indicate a range of problems that can be illuminated by the use of quantitative techniques. Equal importance is attached by all contributors to the collection and analysis of detailed case material, a topic explored in J. van Velsen's essay. A. L. and T. S. Epstein, V. W. Turner, and M. G. Marwick consider the kinds of data relevant to anthropological discussion in the fields of economics, law, ritual, and witchcraft, and the methods by which such material may be collected. The volume is introduced by Max Gluckman, former director of the Rhodes-Livingstone Institute and former head of the department of social anthropology and sociology, University of Manchester.